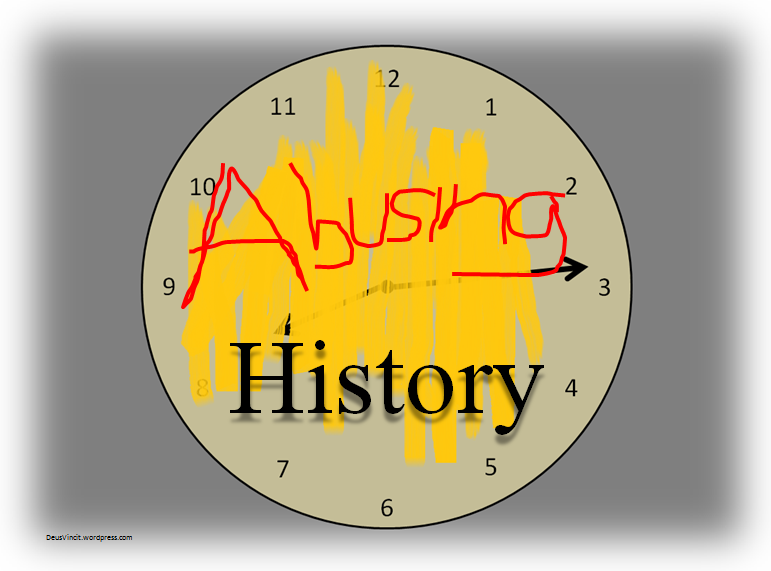 Here’s one thing which really bothers me: the abuse of history. It shows itself most often in two different ways, both of which are very disturbing. First, people tend to airbrush history in order to confirm their own biases. And second, people today tend to view previous generations as know-nothing imbeciles. Both of these end up failing present society in very tangible ways. The airbrushing of history has been a concern of mine since I was a teenager and studied the roots of communism as it took hold of the Soviet Union. The irony was never lost on me that so many of the main actors in the Bolshevik Rebellion found themselves murdered and deleted from Soviet history in the same very literal ways as the Tsars – removed from historical records and airbrushed from photographs. It seemed to my teenage brain that something as obvious and hideous as denying another person’s existence could only take place amongst a people who had lost any concern whatsoever for truth. More years on this earth have confirmed those initial thoughts because a lost concern for truth is a requisite corollary to a subscription to humanism. Beyond that though, I have found that the issue is much more widespread than early 20th century Russia – it is everywhere, in every time. It’s certainly an easier thing for a person’s feelings and psyche to airbrush history. After all, if you believe in absolute truth you have to fully acknowledge the horrible failings of human history (Auschwitz is still there to be seen and felt). However, it’s much easier to pretend that certain atrocities have been exaggerated by people with ulterior motives; which in turn leads to actions like denying the holocaust or playing down the systematic elimination of millions of political dissidents and ethnic minorities by Stalin. If one can say that the atrocities perpetrated in the past were not as bad as those living at the time said they were, or that the people living at the time were lying in the first place, one can float along with an unchallenged notion of basic human goodness. It is purposeful confirmation bias by that person because it provides some alleviation of guilt – the guilt of humans as a species and the guilt of a human being individually. But we know that humans ARE guilty, generally and specifically, because we see it daily. We can watch groups of people make mistakes, and then lie and cover them up; and, if we’re honest, we can see ourselves do the same thing. To deny that is to deny our senses (on the order of seeing the scratch marks in the chambers of Auschwitz and still deny the grisly, heinous end of the Jews who were murdered there). Even if a person retreated to a life of complete solitude one could not escape this fact because wrong actions, thoughts and intentions would all be rampant by that same individual. It’s a curse that we have, a disease within us, and it is subsequently irrefutable that human nature is fallen, bent and broken. The other way in which history is denigrated is by people viewing those who have gone before as a horde of morons. To believe this you either have to believe that mankind is continually moving upward developmentally or you must believe that human nature has changed over time. As we just established above, both ideas are false. The simple fact that the 20th Century was the bloodiest in human history, with the 21st not showing any sign of improvement, should be evidence enough of these falsehoods. But one only needs to read the pages of a daily newspaper to also confirm that even if we have changed over the generations, we are not deserving of the pedestal on which we place ourselves. Still, somehow people assume that they are living in a more enlightened age – indeed the MOST enlightened age. As if they confuse having a cell phone on their hip with having some new-fangled ethic in their heart. They assume that nothing has ever been lost from human experience and that the human heart has followed the same trajectory as human technological innovation. This hypothesis probably has its genesis in the way history is presented sometimes. Here in America, for instance, we teach our history often in two courses – one leading up to the Civil War and one the aftermath through today – as if the dividing line for everything was the abolition of slavery. Since we all agree that getting rid of slavery was admirable and righteous, a correlation can be drawn by the inattentive person that barbarism was more widespread before 1865 than after. However, even if you could get a person who subscribed to this thinking to acknowledge that slavery is still rampant in our day – though thankfully no longer recognized or legitimized by our governing bodies – you would likely still find it an uphill task to get them to acknowledge that comparable (perhaps even GREATER) sins are on our heads today (rampant abortion anyone?). And THAT is the attitude about which I am talking: one which says that generations which have lived in the past were necessarily a bunch of bigoted, sexist, racist, homophobic, science-hating Neanderthals. This thinking juxtaposes all of the blood and sinew of the millennia past against the enlightened, righteous genetics of today. But both the philosophy which says we have nothing to learn from our forebears and the one which airbrushes the less-desirable or inconvenient things from history have made a horribly fatal mistake. To not learn from both the mistakes and victories of previous generations is to make the same mistakes over and over again; and to deny what has happened in the past because it does not conform to our biases is to deny that truth can even exist. The former leads to a spiral of barbarism, the latter a vortex of lies. Because we are battling such a seditious foe in humanism, most of the time we don’t even notice the change in our thinking occurring. We don’t see how the hubris of our current generation erodes our ability to learn the best lessons established in history. And so we move easily from thinking highly of our age to denigrating all ages past and it is our philosophy which suffers as Plato is replaced by Lena Dunham, Sophocles by John Stewart and Thomas Aquinas by Christopher Hitchens. And by airbrushing the work of William Wilberforce (for example) because he – as a white, male, British, 18th century Christian – doesn’t fit your preconceptions of a champion of equality, we only make ourselves poorer by the undermining of the significance of his work. Let us truly be honest with ourselves. Is 2015 really a wonderful time to be alive? Worldwide we have rampant poverty, class mistrust, unchecked disease, government oppression, massive inflation, racism, jihad, murder, war, terrorism, hunger, thirst and malnutrition … just like every other year in human history … and just like it will always be in the future. Here’s the unvarnished, God’s honest truth: un-airbrushed history teaches us that human nature does not change because we are fallen, bent and broken; disease-ridden with sin. Which means there is only one solution: our ancestors have taught us that only something extra-human can fix our humanness – God working through the words of Paul, the energy of Wilberforce, the hands of Mother Teresa, and the strength and resolve of God’s church. If you want to know why history is denigrated, look no further than this truth: we are sinners, but God can still use us for something beautiful.